지난 11월의 서울에서의 세 번의 공연과 허리케인 샌디 쉘터 공연, 뉴저지 은혜가든 양로원에서의 공연을 성공적으로 마치고 이노비는 12월에 모두 6번의 아웃리치 공연을 준비 중에 있습니다. 모두가 행복해하고 가족과 즐거운 시간을 보내는 이 때 병들어 아파하고 외로워하는 이들을 위해 이노비가 마련한 무료공연을 가지고 소외된 분들에게 찾아갑니다.즐거운 연말, 연시 되시고 추운 겨울, 소외된 이웃을 한번 더 생각해 주시면 감사하겠습니다. 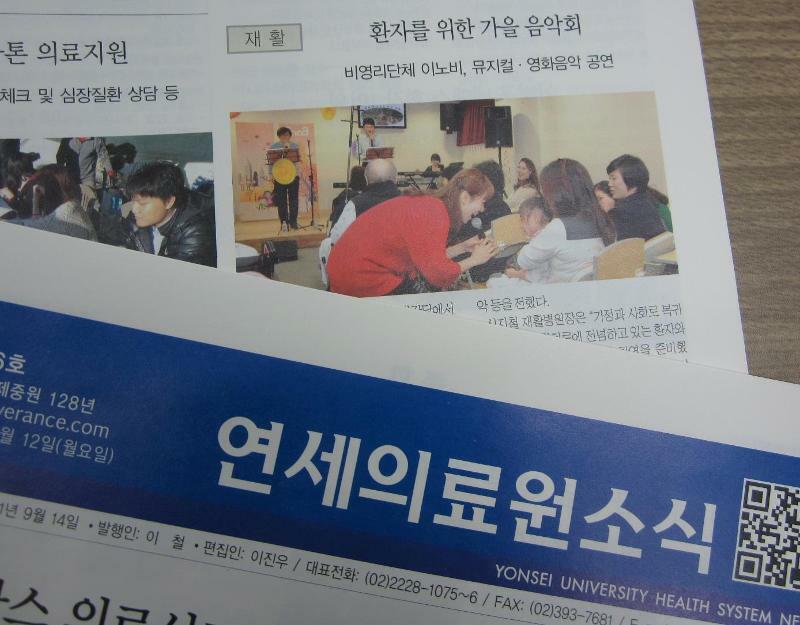 The three consecutive concerts in Seoul, the concert at New Jersey Nursing home and the outreach concert at Hurricane Sandy Shelter in Queens College were huge successes last November. This coming December, EnoB is planning a total of 6 outreach concerts. The holiday season, which many call it a season of the love, is coming and EnoB will console people who are suffering, injured, and separated from their families with music concerts. 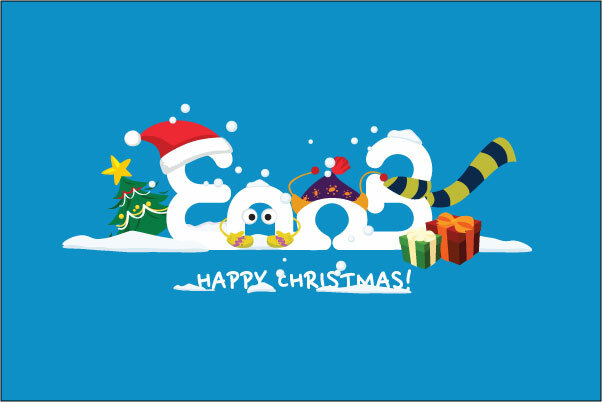 I hope you have a pleasant holiday season, and EnoB will be grateful if you can spare a little time and attention to the people around you. 11월 1일 목요일에는 서울대학교 어린이병원 (병원장: 노정일) 을 찾아가 입원환자와 가족들을 위한 콘서트를 개최했습니다. 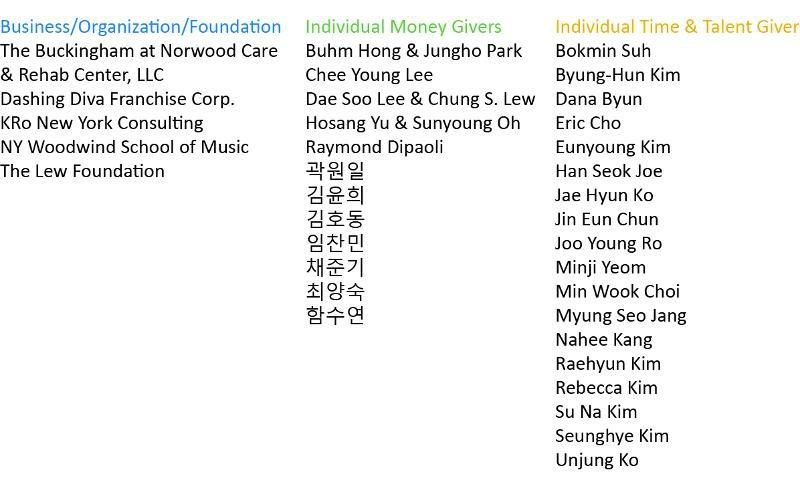 음악감독 장지영, 뮤지컬 배우 김유진, 문진아, 김도원, 성재, 키보드 구자림, 드럼 유범열등 유명 뮤지컬 배우들과 실력있는 뮤지션들이 서울대학교 어린이병원 환자와 가족들 80여명 대상으로 즐거운 공연을 펼쳤습니다. 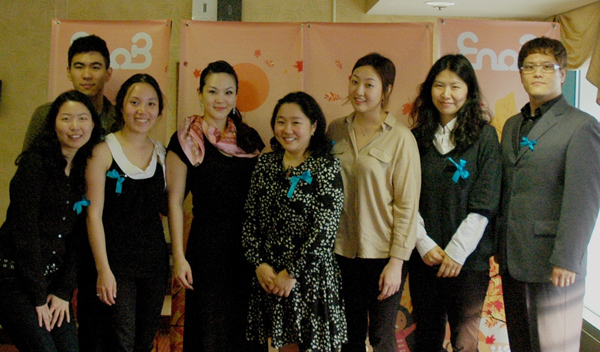 On November 1st, EnoB visited about 80 children and their families at Seoul National University Children's Hospital. 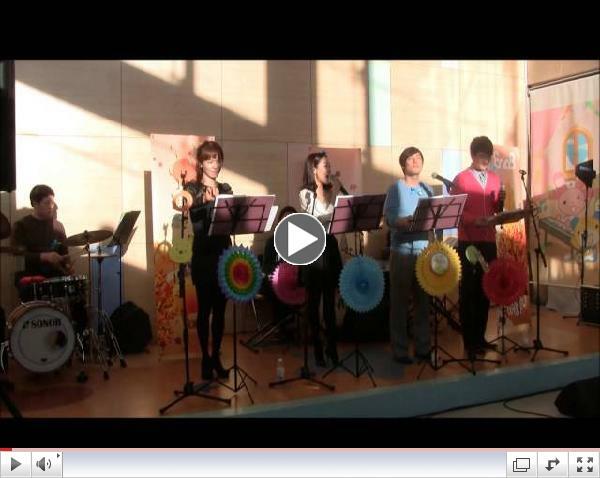 Talented musical performers entertained children and helped spreading happiness through a concert. 11월 6일 화요일에는 연세대학교 세브란스 재활병동에서 '이노비의 찾아가는 음악회'가 열렸습니다. 이 음악회는 재활병원에 입원 중인 환자와 가족들에게 따뜻한 위로가 되어드렸습니다. 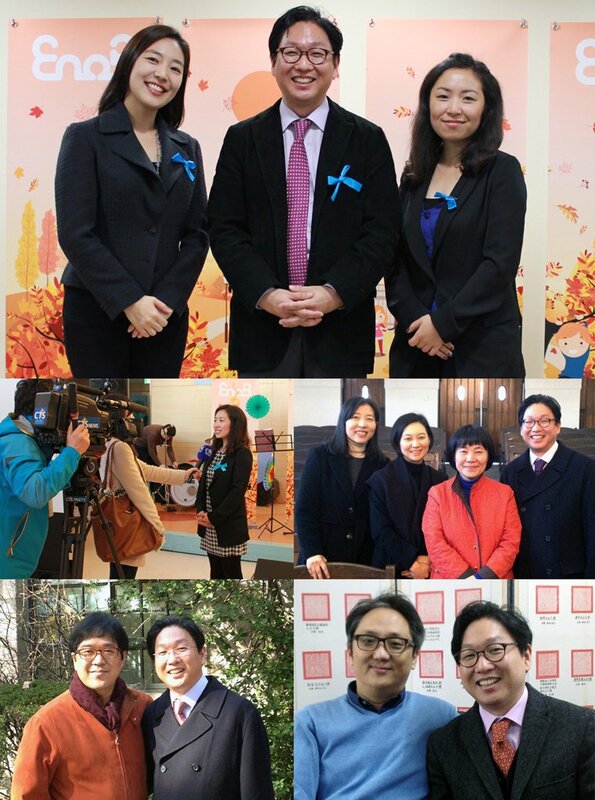 EnoB's first outreach concert for Yonsei University Severance Hospital was held on November 6th. EnoB provided beautiful music to comfort the patients and their families. 11월 7일 수요일, 서울 아산 병원에서 이노비의 찾아가는 음악회를 열었습니다. 약 200~400명의 환자들과 가족들에게 행복을 전달하고 돌아왔습니다. 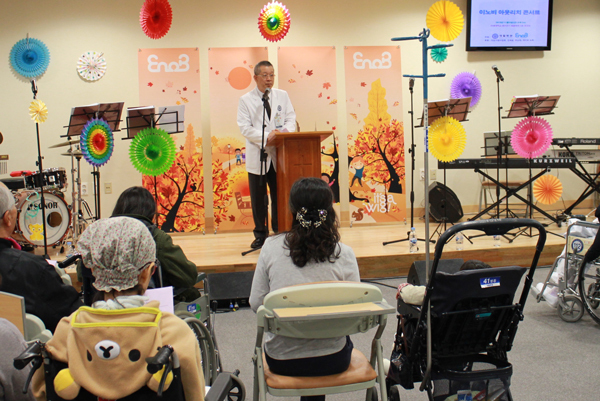 On November 7th, EnoB held our Outreach concert for patients and their families in Asan Medical Center and we spread happiness through the concert. 허리케인 쉘터에서의 공연 동영상을 보시려면 아래를 클릭하세요! 11월 13일, 이노비는 허리케인 샌디로 인해 피해를 입고 퀸즈 칼리지의 쉘터(대피소) 에서 생활하고 계신 450여명의 분들에게 찾아가 음악회를 열었습니다. 이 날 공연에는 줄리어드 출신의 세계적인 바이올리니스트 주디 강, 그레이스 월렛과 소프라노 이정은님께서 봉사로 참여해 주셔서 You raise me up과 신나는 미국 민요, 그리고 아름다운 클래식 곡으로 지친 분들의 마음을 어루만지고 위로해 드렸습니다. On November 13th, EnoB visited Hurricane Sandy shelter in Queens College to hold a small concert for about 450 displaced people staying at the shelter. The purpose of this concert was to bring comfort and positive energy to those impacted by the devastation of Hurricane Sandy. In this concert, Violinist Judy Kang and Grave Wollett, and Soprano Jung Eun Lee volunteered to play beautiful classical pieces and sing "You Raise Me Up." We hope that this concert helped ease the pain of those affected and displaced by Hurricane Sandy. 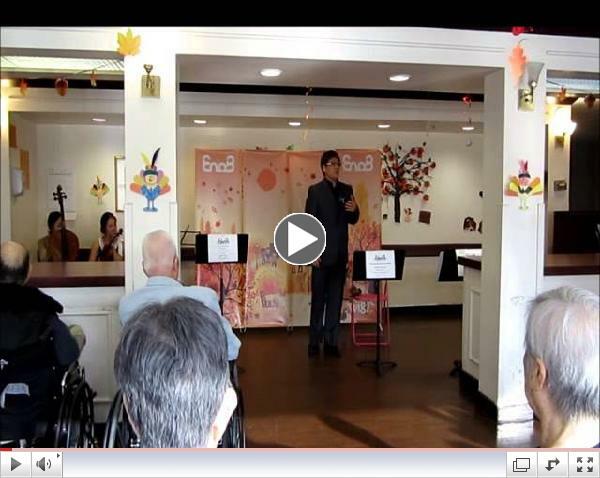 In celebration of Veterans Day, EnoB held an outreach concert for seniors at Mercy Gardens Nursing Home in New Jersey on November 12th. Great musicians performed beautiful music including opera arias, musical soundtracks, and the national anthem of the U.S. and Korea. 이노비가 신사동 사거리에 오피스를 열고 활동을 시작했습니다. 예정대로 이노비 서울의 양매화 이노비 실장이 첫 직원으로 근무를 시작했습니다. 서울 오피스를 통해 지속적으로 한국에도 이노비의 행복나눔이 전달되길 바랍니다. 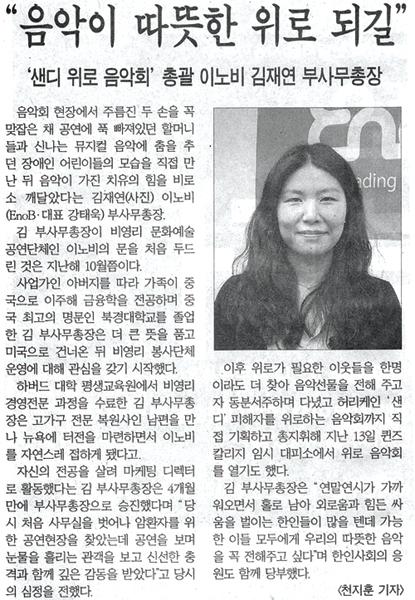 EnoB has opened a new office in Seoul. 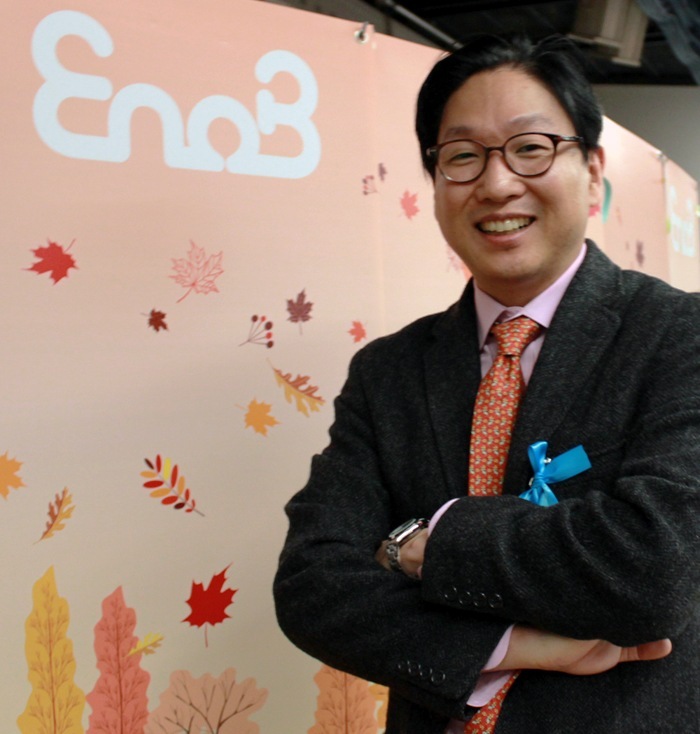 Maehwa Yang, who previously held a PR manager position at EnoB NY, has been promoted to general manager of EnoB Seoul office. 이노비의 새로운 인턴 Jaki Yi 를 소개 합니다. Jaki님은 이번 해 뉴욕 대학교에서 심리학을 전공하게 된 신입생으로 앞으로 음악심리 치료사가 되어 많은 이들에게 도움을 주고자 하는 꿈을 가진 이노비의 새로운 인턴입니다. 지난 9월 이노비 베네핏 콘서트를 통하여 이노비와 인연을 맺게된 Jaki님은 삼촌과 숙모이신 유호상님과 오선영님을 통해 처음 이노비에 대해 알게 되었고, 그 후 발룬티어로 콘서트에서 활약을 해주셨습니다. 이노비에 오게되어 그 전에 경험하지 못한 많은 것들을 배우게 되어 감사하다고 말하는 Jaki님은 앞으로도 꾸준히 어려운 상황에 있는 아이들에게 도움이 되고, 장애 어린이들에게 음악을 통해 힘이 되어 주고 싶은 꿈을 지닌 아주 멋진 이노비의 인턴 입니다. 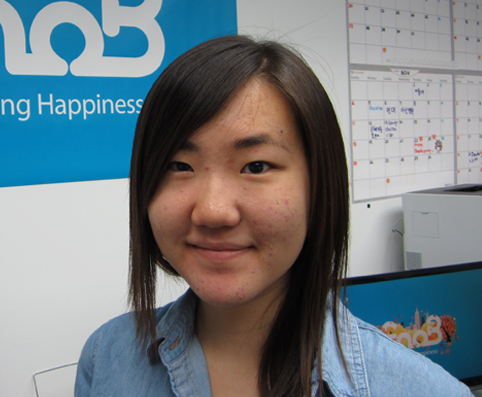 Jacqueline Yi is our newest intern at the EnoB offices. She is a freshman majoring in undergraduate Applied Psychology at NYU Steinhardt and hopes to become a music therapist in the future. 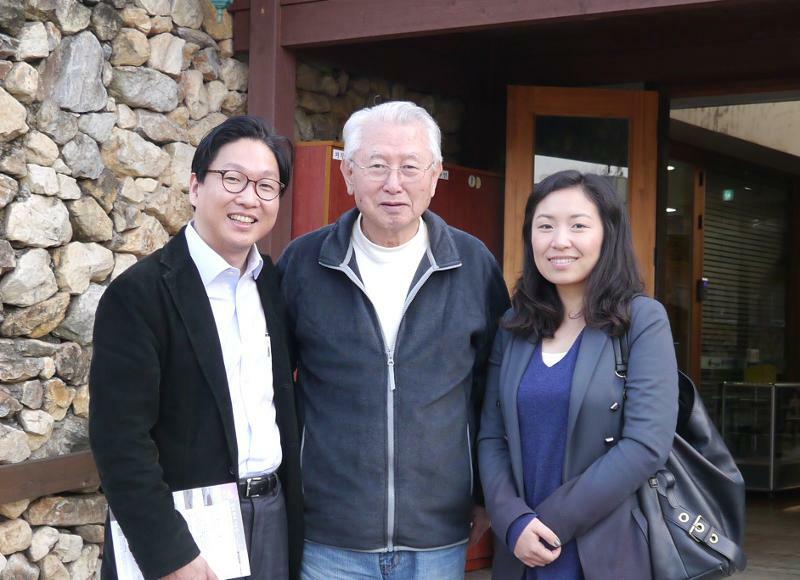 Jaki first heard about EnoB from her uncle and aunt, Richard and Sunyoung Yu, who are supporters of EnoB and classical music ensembles. She volunteered at the High Cool Benefit Concert in early September, and she has now begun to intern at the EnoB offices. "This is my first experience working in an office, and I'm learning a lot." Jaki looks forward to volunteering at many outreach concerts, especially those that involve disabled children. "In the future, I hope to work in the therapy field with disabled children. I am excited to see the influential power of music on patients." 이노비 주니어 스탭 Ashley Yu를 소개합니다. Great Neck South Middle School 6학년에 재학 중인 애슐리는 작년 Solisti Ensemble과 함께한 이노비 베네핏 콘서트를 통해 처음 이노비를 접하게 되었는데요, 그 후로 이노비의 놀라운 활동들을 듣고 이노비의 일원이 되기로 마음을 먹었다고 합니다. 애슐리는 지난 9월에 있었던 이노비 베네핏 콘서트에 발룬티어로 참여했는데요, 콘서트에서 새로운 사람들을 만나고 그들과 소통을 할 수 있었다는 점이 인상 깊었다고 합니다. 베네핏 콘서트에서의 발룬티어 경험을 통해, 어린 나이에 상관없이 자신의 작은 행동이 누군가의 삶을 바꿀 수 있고, 또한 큰 도움이 된다는 것을 알게 되어 너무 즐거웠다고 합니다. 애슐리는 이노비의 "행복 퍼트리기"에 동참할 수 있다는 사실에 즐겁고 기대된다고 하는데요, 앞으로 이노비 주니어로서의 애슐리의 멋진 활약을 기대합니다! 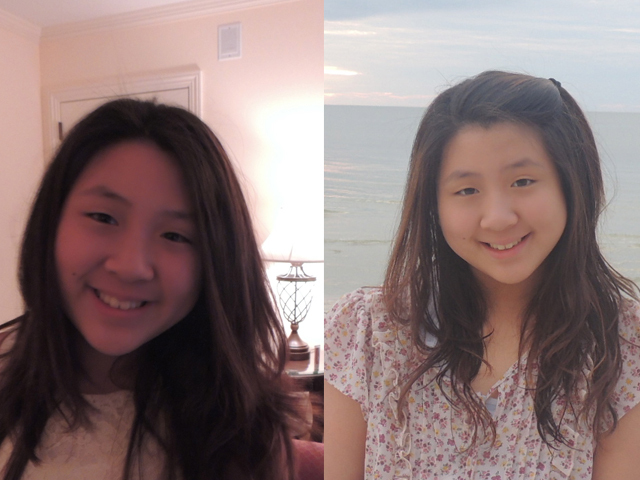 Ashley is a 6th grade student in Great Neck South Middle School. She first learned about EnoB after the Benefit Concert with Solisti Ensemble last year. Soon after hearing about the amazing things that EnoB does, she wanted to become a part of EnoB. Ashley volunteered at the Benefit Concert in last September, and her favorite part of the concert was to meet new people and communicate with them. "It was an amazing experience, knowing that I was doing something to help. I then knew that I may be young, but I can still help and make a change in someone's life, by starting with small actions." Ashley is excited to help out at EnoB and help 'Spread Happiness.' EnoB is thrilled to see such an enthusiastic addition to EnoB Juniors. Welcome to EnoB, Ashley! 아래 날짜와 사진을 클릭하시면 이노비의 기사를 보실 수 있습니다. 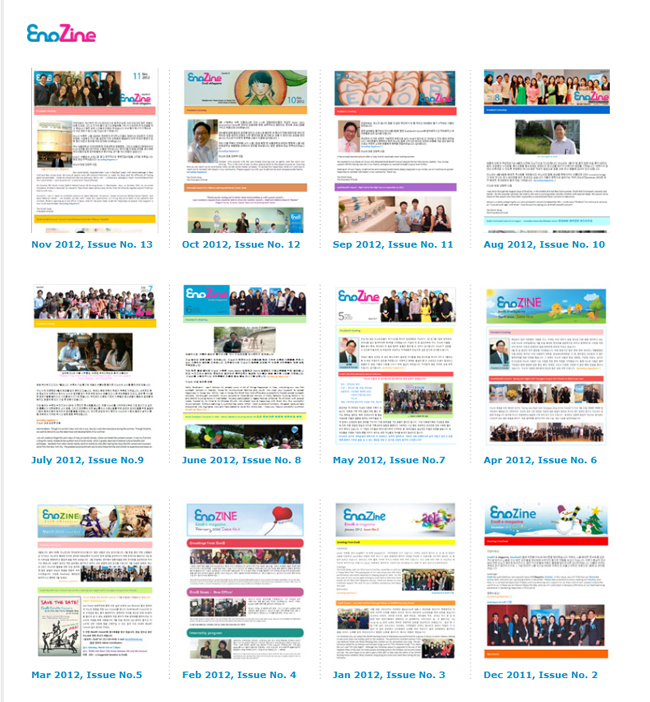 Click the date & the photo to view the news articles & Media covers on EnoB. 12 월, 이노비는 특수교육이 필요한 아이들을 위한 릴레이 크리스마스 콘서트를 개최합니다. 12월 1일 뉴저지 초대교회의 특수예배부서인 히스 프렌즈(His Friends) 공연을 시작으로 12월 15일 뉴욕 코코 장애아동 서비스센터, 12월 22일 뉴저지 밀알 장애인단체 아이들을 위해 신나는 크리스마스 콘서트를 선물할 것입니다. 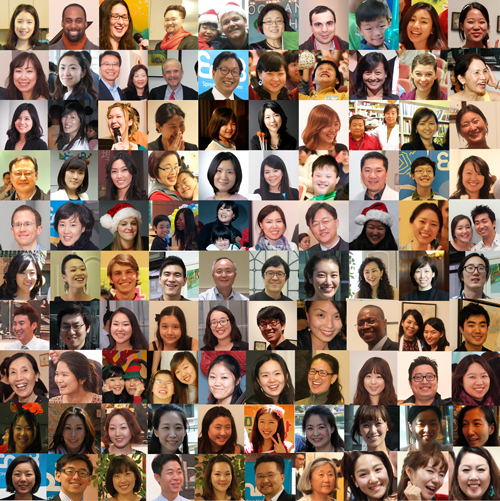 In December, EnoB will host a series of Christmas Outreach Concerts for His Friends of NJ Chodae Community Church, COCO, and NJ Milal Mission. Through these concerts, EnoB will provide an opportunity for a group of special needs children to enjoy live music and share the joy and happiness with their families. 이 노비는 연말을 맞아 몸이 불편한 어르신들을 찾아가 신나는 캐롤과 아름다운 음악이 함께하는 크리스마스 음악회를 열어드릴 예정입니다. 12월 14일에는 뉴저지에 있는 홀리 네임 병원과 크리스마스 이브에는 맨하탄 드윗 널싱 홈에서 이노비의 크리스마스 콘서트가 개최됩니다. EnoB will hold beautiful Christmas concerts to seniors in Holy Name Hospital in New Jersey and DeWitt Rehabilitation & Nursing Center located in Manhattan on 79th Street. 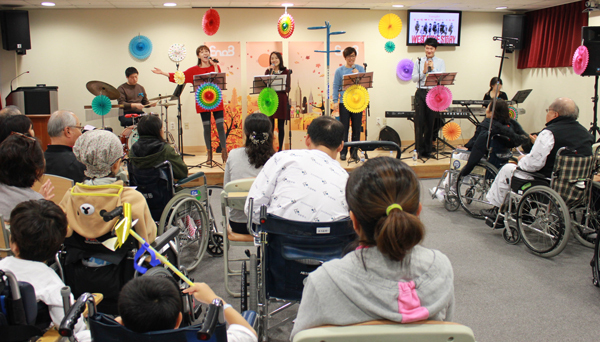 Through these concerts, EnoB will help lessen the isolation and loneliness of seniors in hospitals and nursing homes. 12 월 17일, 이노비는 서울 삼성병원의 한가족 의료 봉사회와 함께 병원의 환자들을 위한 콘서트를 개최합니다. 성탄절에 환자들을 위한 콘서트에 안수경 음악감독님을 비롯한 유명 뮤지션들이 즐거운 성탄음악을 가지고 찾아갑니다. 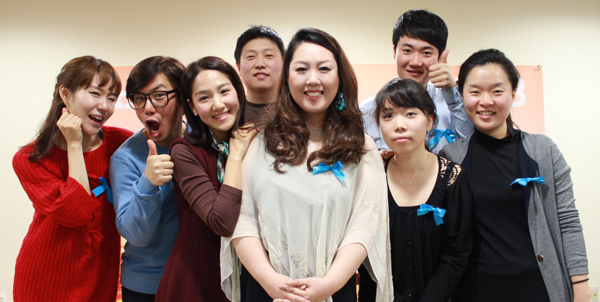 On December 17th, EnoB will hold an outreach concert in Samsung Hospital and spread seeds of hope to patients and their families. 이노비의 예쁜 머그컵을 구매하시면 수익 전액이 이노비의 행복을 전하는 활동에 기부됩니다. 주문은 이메일(enobinc@gmail.com) 또는 전화(212-239-4438)로 해주세요! 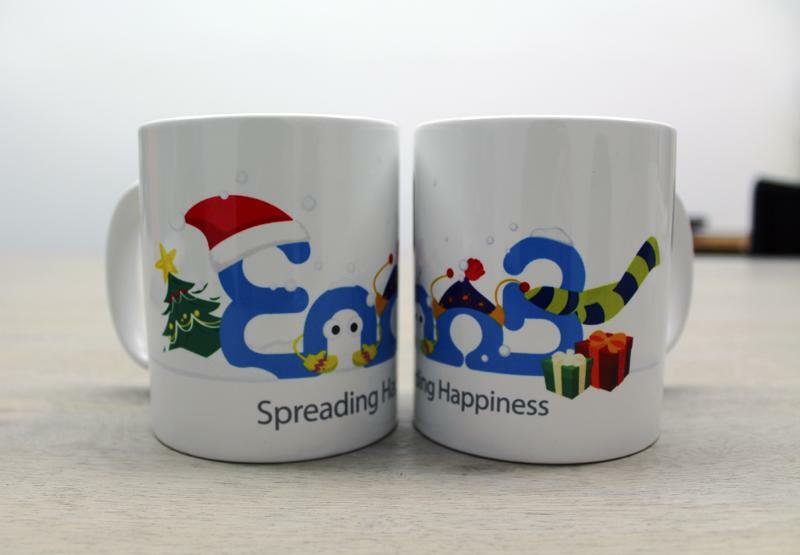 EnoB's limited-edition mug for the winter is now available! Let's get this lovely new mug and help where it's needed. All proceeds will be donated to EnoB to spread happiness. $20 Each!